Humility, a term associated with giving in, standing down or acting passive is actually better suited to describe the world’s greatest leaders. Recent articles from the business, political, military and blogging sphere, have caught on that humility is a quality closely associated with the greats. In Harvard Business Review, leadership researcher Jeanine Prime PhD, learned after assessing statistical data at the Catalyst Research Center that humility is critical for successful leadership. Regardless of the field of work, humility is one of four key factors that create a healthy environment for employees to feel included in a bigger mission. As an aspect of leadership, humility when learned brings self-awareness and self-criticism required in any field of work. Since there are many critical of the trait, it causes some to question whether humility is a useful skill for world leaders and other jobs that require interaction with dangerous opponents. The components of humility that make a great leader include a will to engage in dialogue, teamwork, martyrdom and spirituality. It benefits to observe leaders willing to risk it all, opening up to spirituality and dialogue to help the greater good. To promote teamwork is also essential since the best outcome can only be accomplished by the whole not one selfish individuals against change. It is evident in both business and political spheres that connecting with the people by giving society more than expected, brings support and respect. Humility is a leadership trait that must be mastered as shown through the greats, by committing to dialogue, teamwork, martyrdom and spirituality. Dialogue with the opposition, allows for communication and that benefits the common goal. This is shown through Nelson Mandela he admitted there was a need to negotiate with the predominantly white ruling party, led by de Klerk. Both worked to bring stability to South Africa in a conflict free method. In the film “Mandela and de Klerk” directed by Joseph Sargent, de Klerk, wanted to work with Mandela since he believed that was the answer to peace and to stop United States sanctions. Mandela responded to his proposal with openness, saying in the film, “Mr. de Klerk, this is the first time I sensed a level of integrity, unlike many of your predecessors, so yes I will work with you.” Mandela did not have any chance of achieving such a goal if he continued forward with his fiery passion or by listening to his colleagues who refused to negotiate out of fear of what the black community. Harvard Professor Joan Johnson Freese advises, “If you can find a leader you can work with do so.” Mandela did just that and achieved justice for the human rights of his people, the driving goal of the ANC. Mandela took a major risk by going against the will of his communist freedom fighting colleagues at the ANC who refused to cooperate with the government. Other ANC members imprisoned at the time were afraid of the backlash from black Africans for working with the government that abused blacks on the streets day and night. The greatest display of humility is when an individual is willing to put aside an elite title -- as a prince and head of the ANC -- to cooperate with the opposition. As a result, Nelson Mandela’s “soft power” managed to unify a deeply divided nation. Although there is much work to be done to quail all racism, it was Mandela who first recognized the need to negotiate in order to achieve a level of peace. Teamwork must be practiced by a leader, since it is the combined action of a group of people, not the individual that achieves the best result. Whether it’s George Washington or John F. Kennedy, both Presidents were humble enough to be aware that peace could not be achieved by one man. In the Newburg Affair, President George Washington had to resolve the frustration of officers who were tired of fighting what was believed to be a losing battle. Unlike most Presidents we see today, he was involved in military campaigns, fighting with his men to achieve victories. The Newburg speech worked to convince his troops who were not getting paid not to give up as everyone was in the fight together: “I am tired and am one of you, I am asking you to be selfless in this situation.” As a result, George Washington has been appreciated as an American hero and founding father who developed the nation’s identity in the face of countries who wanted to see a defeat. It is essential for leaders to wear humility and stand at the same level with his/her men in sensitive times of war when most fighters have not chosen to be there by will due to the draft system. When talking to his soldiers he told them that he was at the same place emotionally and physically. Furthermore, he worked to build a bond beyond employer/employee, more like a family where everyone was equally valued. Similarly, in the Cuban missile crisis John F Kennedy wanted to bomb the soviets out of anger but listened to his colleagues and decided not to – which was the right decision. Instead of flexing American military might to scare the Soviets, Kennedy worked to warm relations with a volatile world power. He spoke directly to the people whom most Presidents tend to speak above and had the populace feel involved in the solution by asking for the softening of hearts towards Russia: “For in the final analysis, our most basic common link is that we all inhabit this small planet. We all breathe the same air. We all cherish our children’s future. And we are all mortal.” Another specific instance was when he famously stated, “Ask not what your country can do for you but ask what you can do for your country.” This demonstrated the humble leadership attitude he wanted to instill in the people who voted him into office. Being willing to die for a cause is a martyr’s approach to leadership that greatly benefits any President. In the 1949 film “Twelve O’Clock High” General Frank Savage chose to risk his own safety leading every daylight bombardment mission on the Nazis and pushed his pilots to do the same when saying, “Consider yourself already dead.” His boss was upset that Savage had been flying more missions and assumed he was becoming emotionally attached to the pilots, which could not be risked since he was too valuable to be in a dangerous flying mission. Savage explained to his boss the need to go with the young pilots in order to ensure a successful mission. He respectfully acknowledged advice but remained dedicated to personally training the inexperienced men, “Till I know they are ready I am not about to turn them loose Sir.” His boss followed this response by showing gratitude to Savage’s determination to accomplish the mission, asking him to bring back a German ball bearing as a souvenir. These actions made him a great leader for young inexperienced soldiers and a good employee for his boss who struggled to influence his men to lead successful campaigns. Savage not only pushed his men to die for the cause but also followed through by organizing and leading each bombing campaign until the end. As a result of the success, Savage earned greater respect from his colleagues and pilots. It is uncommon for world leaders today to consider dying for peace but the unpredictable reality of high level jobs regardless of the field, brings much danger to one’s health. It is sensible for all future leaders to ask whether the career path being pursued is worthy of dying for, potentially helping others live a better life. Human rights advocate, Dr. Martin Luther King also willfully put the value of his life beneath the importance of achieving social justice for black people in the United States. Before his speech famously said how he’d prefer his funeral to be simple and emphasized his commitment to dedicating his life to public service, “I’d like somebody to mention that day that Martin Luther King Jr, tried to give his life serving others. I want you to say that day hat I tried to be right on the war question.”A speech that brought Dr. King great respect was his heartfelt words on a lifelong dedication to helping others, stand up for outcasts, encouraging them live the dream. In the act of prophesying his own death, Dr. King inspired young black men and women to move forward fearlessly in the pursuit of freedom. 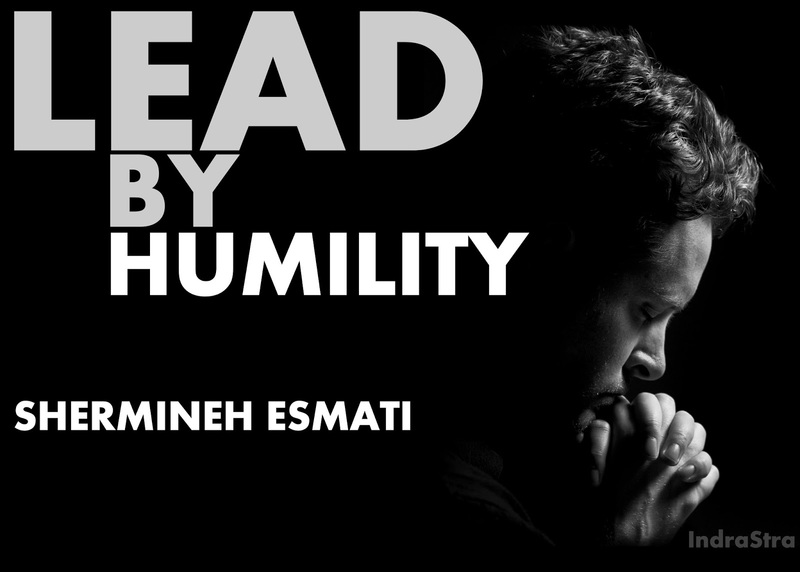 Spirituality, a quality of acting in faith, is also key in groundbreaking humble leaders. Martin Luther King’s speech illustrated a raw and honest motivation to help others out of a fear of God: “If I can help somebody as I pass along, if I can cheer somebody with a word or song, if I can show somebody he’s traveling wrong, then my living will not be in vain. If I can do my duty as a Christian ought. If I can bring salvation to a world once wrought, if I can spread the message as the master taught, then my living will not be in vain.” Anyone considering leadership as President must imitate Dr. King’s humble soul that purely worked in pursuit of seeing others succeed. When one can put the interest of God ahead of their own, that is what defines a truly great leader. Research done on Steve Jobs by phycologists Bradley Wallace, Angela S and David Waldman in “Leader Narcissism and Follower Outcomes: The Counterbalancing effect of Leader Humility” exposed that the CEO possessed the traits of a humble great leader but balanced this trait with narcissism for his craft. The paper concluded that employees benefited from a boss like Steve Jobs who tempered his narcissism with humility, making for an effective team. It is also important to recognize Jobs’ close friendship with Bill Gates, sharing ideas and compliments, which solidified his willingness to give credit regardless of a competitive industry. Pushing employees to produce high quality work without shattering anyone’s spirit successfully achieved the end goal of making Apple the best in its industry. Steve Jobs commitment to humility was a result of practicing his Zen Buddhist faith that required followers to do unto others as he wanted for himself. Although there is controversy about his rigid approach to some colleagues, he focused that humility in developing simple products and encouraging employees to challenge his aggression. In Inc Magazine Jeoffrey James confirmed Jobs’ humility was a result of his meditation, admitting that he needed to use spirituality to deliver creative ideas: “You see so much more than you could see before.” Whether Jobs prayed day and night is unclear but his general faith in a higher power made him commitment to improving the quality of life of his customers, reflected in a tireless effort to make Apple products bring peace to peoples’ busy lives. Which Buddhism helped motivate his desire to help others live a better life through simple products, as stated by biographer Walter Isaacson, “Instead of relying on market research Jobs honed his version of empathy – an intimate intuition about the desires of his customers.” He worked to master his thoughts in order to provide the best product to his customers. In the biography channels documentary, biographer Walter Isaacson, made thoughtful observations that Steve Jobs similarly relied on his faith in Zen Buddhism showed up in designing the sleek Apple products and the motivation to make life stress free for all his consumers. Also looking at concept of “good karma” when Jobs charged 99 cents for songs on ITunes when he did not have to charge consumers since songs were easily downloaded for free at the time.The concept of “good karma” is an understated form of humility that seeks to help the other without pursuing recognition for the good deed but expecting an equal blessing in return. The counterargument that arises against these great leaders is that humility was not the leadership trait that helped these individuals succeed. Instead it was pushy corporate attitude that accomplished the mission for some of these leaders. Specially, Steve Jobs has understandably been a controversial figure as argued by Dr. Jim Eckman of Grace University to have been a difficult boss for many employees since his faith in Zen Buddhism left him in the dark. According to Dr. Eckman, Zen Buddhism did not bring any peace to the Apple team as only Christianity has the ability to instill authentic faith. The argument made by Dr. Eckman focuses much attention on what is believed to have been Steve Jobs attitude towards all employees. However, when studying his relationship with Bill Gates and colleagues he consistently showed an interest in the advice these thinkers had to share. In televised interviews with Bill Gates, Steve Jobs spoke with honesty about his friend’s accomplishments. More importantly, Jobs constantly explained to media that his products were made to improve the lives of its owners through its simple Zen like design. Simplicity is the key to humility, a product quiet in design hide much sophisticated hardware under its demure casing. All the more, to those young and old in pursuit of leadership, it is wise to spend time studying great leaders in both the political and business realm. Though critics may argue humility is not a common trait in great leaders, these individuals lack an understanding of the definition. Humility is commonly associated with passivism, standing down or giving up but in truth it is an honest assessment of ones abilities. More than any of the four qualities mentioned, martyrdom is the most powerful, requiring maturity and critical assessment of ones will to die for humanity. Shermineh Esmati is a Massachusetts based geopolitical and security analysts with primary focus on Iran. She can be reached at her LinkedIn profile. Johnson Freese, “Leadership in War and Peace, Lecture 9”. Harvard Summer School. July 2015.